The Sri Lanka National Rugby Union Team represents  They regularly compete in the Asian Five Nations tournament and are currently in Division I. In the 2010 tournament, they made it to the finals beating Chinese Taipei 37 to 7. Sri Lanka Rugby has a long history, dating back to the days of British colonialism. The first party to introduce Rugby to Sri Lanka is Kingswood College in Kandy, with the first club, Colombo Football Club, being established in 28 June 1879. The nation's first "national" match was on 12 September 1907 and involved an All Ceylon team against the professional All Blacks (the New Zealand rugby league team) under rugby union rules on their 1907–1908 New Zealand rugby tour of Australia and Great Britain. The professional All Blacks won the match 33-6. The Ceylon Rugby Football Union was founded 10 August 1908. In 1974 it changed its name to the Sri Lanka Rugby Football Union. Both the 1930 and the 1950 British Lions tour to New Zealand and Australia played unofficial matches in Ceylon on their way home. Mahesh Rodrigo, better known as an international cricketer, also captained the national team. 1995 was the first time Sri Lanka entered into a World Cup qualifying tournament. Sri Lanka was in Group A along with Japan, Taiwan and Malaysia. They lost all three games scoring an aggregate of 30 against 155. Japan went on to qualify for the World cup. Sri Lanka participated in the 1999 Rugby World Cup qualifying and was in Round 1 with Thailand and Singapore. In the opening round, Sri Lanka won both games to qualify through to the second round. The next round was tough for Sri Lanka and it didn't go well with a lost to Chinese Taipei ending the hopes for the World Cup after defeating Malaysia earlier. 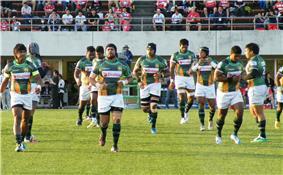 The furthest they have made was to Round 2 of the Asian qualifying competition for the 2007 Rugby World Cup in France. The Sri Lanka rugby team performed above expectations during the qualifying campaign for the world cup, and saw its world ranking improve from 68th place to 43rd place, and its Asian ranking improve to fifth place. Sri Lanka won Division One of the 2010 tournament beating Singapore (23-16), thereby winning promotion to the 2011 Asian Five Nations Top Five. ^ "Sri Lanka Sports News". Sundayobserver.lk. 2011-04-24. Retrieved 2011-12-02. ^ a b A 100 years of Unbroken Tradition! ^ "Sri Lanka Rugby Football Union". Srilankarugby.com. Retrieved 2011-12-02.